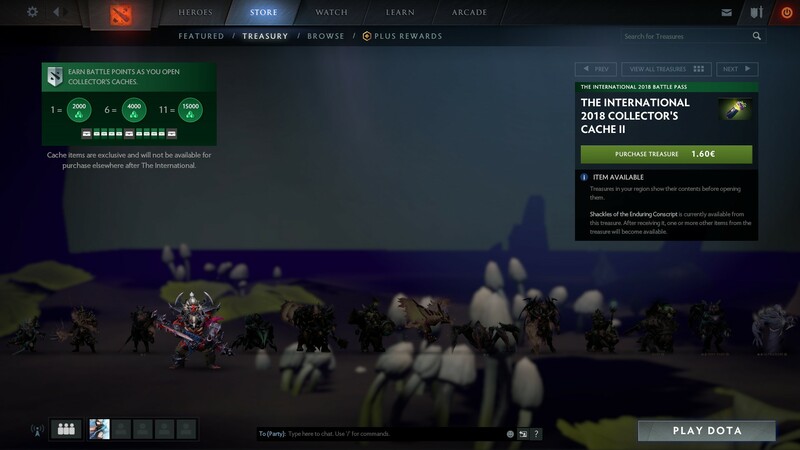 Valve have reportedly stripped the uncertainty and razzle-dazzle from opening loot boxes in Dota 2, but only for players in the Netherlands. When Dutchlanders now look at Dota 2’s loot boxes, which contain cosmetic items, the wizard ’em up simply tells them which item they would receive if they bought it. No hoping, no dreaming, no fancy animations or pounding drums as it shows you the fabulous prizes you could have won, just: chuck us a couple euro and you’ll get this hat for this wizard – wannit? This comes shortly after Valve outright blocked opening Counter-Strike: Gobal Offensive’s loot boxes for Dutch and Belgian players, following government crackdowns on loot boxes. Ah grand, so I paid £1.45 to make a spider look horrible. I tried to confirm that myself but Dota 2 wasn’t fooled by mere IP-changing trickery and ah, gwan, I trust all the players reporting the same. Of course Valve know in advance what you’d get in a box. Of course it’s not decided by chance during that skippable animation. But it is wild to see this stark contrast within the same game. It’s no secret that loot box openings are designed to be exploitative exciting events that make us want to roll again; see developers from games including Overwatch and Duelyst talking with Kotaku last year. If it’s not exciting and I don’t feel I almost got a coveted “ultra rare” set, I’m less likely to keep buying and opening, aren’t I? “Larhf” further reports that they can no longer buy multiple boxes at once, so they’d need to buy them one-by-one and be told individually what is in each. And the fancy animation is not entirely gone, but seems like it’s supposed to be, starting then instantly cancelling. Some Belgian players in that Reddit thread are reporting that they briefly had the same experience as Dutchies, but now they’re back to seeing the same show as the rest of us. Valve don’t explain the change or even list it in patch notes but it is surely down to the Dutch Gaming Authority ruling earlier this year that loot boxes in Dota 2 (and CS:GO) violated the Dutch Betting And Gaming Act as a form of gambling. Well, Valve have removed the pomp and uncertainty, so each Dutch Dota 2 loot box is now an awkward skin store with a very limited stock. No one said progress would be flashy. Tagged with loot boxes, Valve, Dota 2.